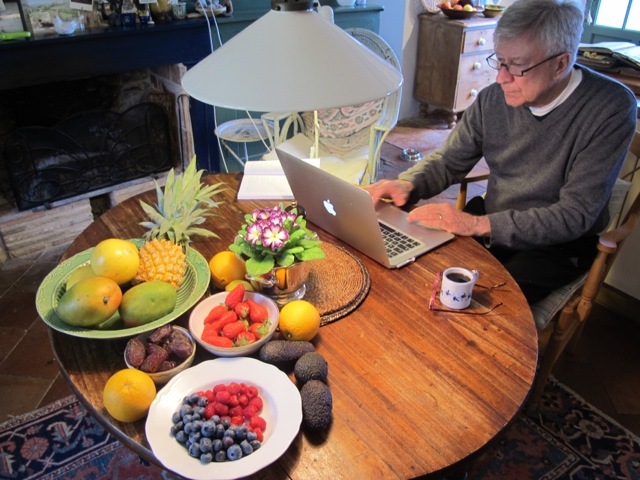 of an old fruit at work on new Cookbook with table full of fresh fruit. Time presses and juices running–with luck. Love the picture, you look content and peaceful. Colorful fresh fruit and a lovely cup of coffee. Have a good day! I accept, that settles it! Looking forward to reading it Robin. Lovely colours of the fruit all looking very tempting. P.S. you will never be old -Meredith would never allow it. You are so delightful….I feel like I know you! I look forward to your posts…they are like notes from a friend. Love your “office” Robin. I hope your next book is coming on well. I I would be distracted by all that lovely fruit! No such thing as old! When Bob was in hospital, the guy opposite said to me that they had mentioned something about being old and he said that he was only 87 and that was not really old, was it? No! I said – you are not old till you are over 100. A few more books yet – but try to keep the stress levels down – keep looking for those new spring dandelions. Good luck with the book although I don’t think you need it! It SNOWED last night in good ol’ NYC! Aren’t you glad you’re in sunny Provence?? Well it’s sunny and Springlike here but it’s not Provence; we live in SW France!Thanks for the recipe. on March 19, 2013 at 2:53 pm | Reply Caroline P.
Looks like my table, full of fresh fruit and (I copied) the round table mat, it is so nice to put on waxlights in glass, at dinner time. You look very serious, that’s the secret to make a book great! What a terrific photo! Love all the colors & am really looking forward to the new cookbook. My husband’s grandfather worked until he was 101. He said old begins at 90! We were there for his 100th birthday, and his only complaint was that his feet hurt. Lovely story–thanks. What was his work and what happened when he stopped working? By the time I get to 90 it’ll be the new 75! Well, it is an interesting story. He was born in Russia in 1892, trained as a tailor, drafted into the Czar’s army, and sent to fight the Germans in WWI. He deserted twice. If they had caught him the second time they would have shot him. He walked across war-torn Europe until he managed to get on a boat for the United States. He then settled down with his wife in a small town in West Virginia and had a very quiet life, which he much preferred. He ran a small general store, and sold a bit of everything, even doing the butchering himself. They put two kids through college, had six grandchildren, ten great-grandchildren and now there is a great-great grandchild. For his hundredth birthday the whole town had a celebration and the whole family came. Our son was seven months old and the youngest great-grandchild at that time, our daughter somewhere in the middle. Even my father came, although he was only related through my marriage, because he loved family occasions, and this one was truly heartwarming. Grandpa kept running his store. By the end, he mostly sold small things, cold drinks, snacks, candy, that sort of thing to kids and their parents. But it gave him an interest and a purpose, which we all need. At 101, he broke his hip going into the store, and he passed away a couple of months later. Keep on keeping on–the secret. At least it’s “downhill” after ninety! You have got a wonderful sense of humor! Thank you!